On Sept. 3, the Manzanar Committee announced the launch of Phase II of its pilot project aimed at educating college-age youth about the unjust incarceration of over 120,000 Japanese and Japanese Americans during World War II, and providing them with tools to help them teach that critical history to others. The committee also announced that it is seeking donations to help defray the costs for this phase of the project. This project began in 2017 under the working title “Keeping Japanese American Incarceration Stories Alive,” a partnership between the Manzanar Committee, National Park Service rangers at Manzanar National Historic Site, and the Nikkei Student Unions at CSU Long Beach, Cal Poly Pomona, UCLA and UC San Diego. Phase II of the pilot project begins with a new name, the Japanese word Katari, which, in this context, means to tell stories. In Phase I, college students from the aforementioned student organizations traveled to the Manzanar National Historic Site, located approximately 230 miles northeast of Los Angeles in Owens Valley, where they engaged with rangers and members of the Manzanar Committee for two days of intensive, place-based, experiential learning at the site of the first of the American concentration camps where Japanese Americans were locked up behind barbed wire during World War II, one of the darkest chapters and one of the most heinous violations of constitutional rights in American history. “As a Shin-Nisei (second-generation Japanese Americans whose parents are recent immigrants from Japan), I always felt out of place within the Japanese American community in Los Angeles,” said Moet Kurakata of the Nikkei Student Union at UCLA. “But this trip made me realize that no matter what generation, age, skin color, or whatever form of identification, Manzanar is a place that impacts you as a member of society. In Phase II of this project, roughly 12 students will make the trip to Manzanar National Historic Site. More former incarcerees will be invited to participate in order to deepen and enhance the students’ learning experience. After the weekend, the partners will then begin the process of determining the feasibility of expanding the project into a permanent one that would reach more college students and more campuses across Southern California. 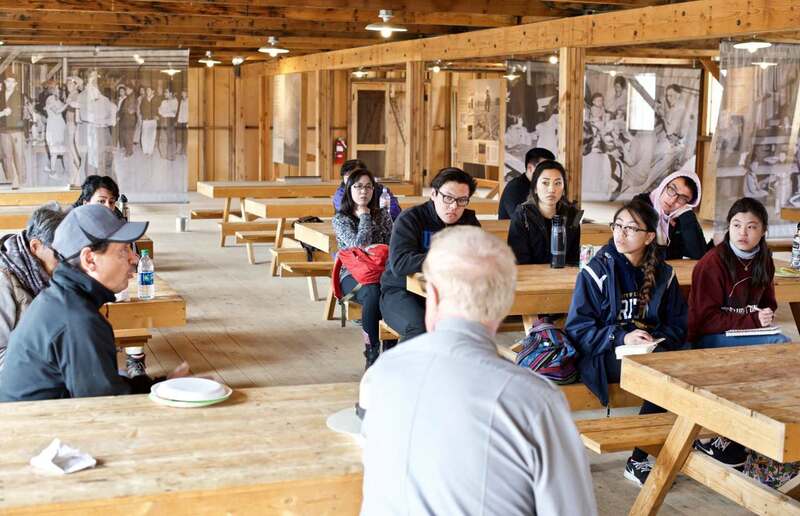 “Students and young people have always played a central role in the struggle to understand and to educate people about Executive Order 9066 and the forced removal,” said Embrey. “In 1969, the first community-based pilgrimage was led by young third- and fourth-generation Japanese Americans, and throughout the decades-long struggle to win redress, students lent their skills and resources to the work initiated by those who had endured camp. The Manzanar Committee has launched a $5,300 fundraising campaign to help defray the costs of food, lodging and transportation for the students and other participants in the project, along with some supplies. Donations can be made via GoFundMe.com at https://www.gofundme.com/katari-jastories and may be tax-deductible (consult your tax advisor). For a detailed overview of otheproject, visit https://blog.manzanarcommittee.org/katari. For further information, send email to k[email protected] or call (323) 662-5102.